I presented myself before Viarmo. I recognized his name. He admitted me before. I lost my acceptance papers, and would be starting my acceptance process over. No family influence to shortcut the process this time, it seemed. 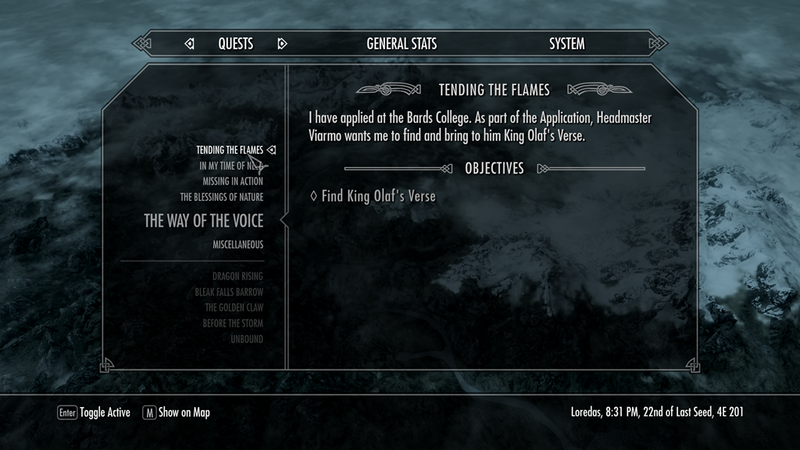 He wanted me to retrieve King Olaf’s Verse as my application. No doubt this would not be a simple run down to the bookstore. Before heading off, I explored the college. The library was a dismal disappointment. The shelves had barely any books. It seemed I was not given a dorm room either. I collected a few things in my travel that I wished to keep, but they were burdening my pack uncomfortably. By the time I finished exploring the college, it was dusk. 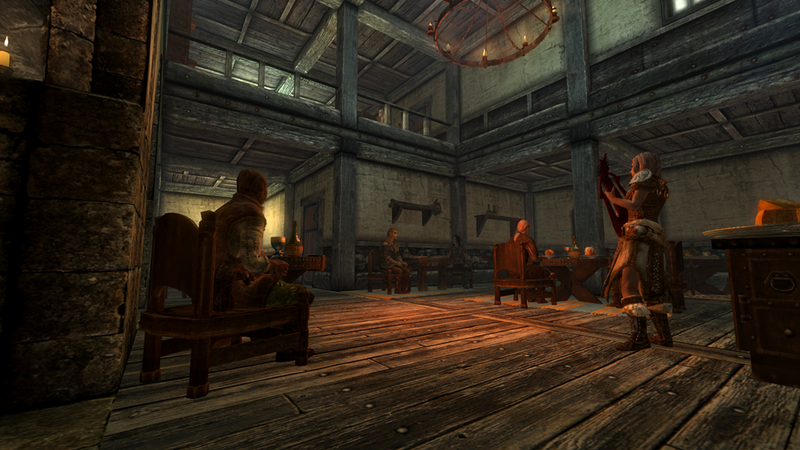 I rented a room for Lydia and I at the Winking Skeever Inn. We dined, drank wine, and listened to the evening entertainment. Lydia and I chatted while we ate. She was born and raised in Whiterun, and lived there her entire life. This adventure to Solitude was the first time she had ever been outside its hold. 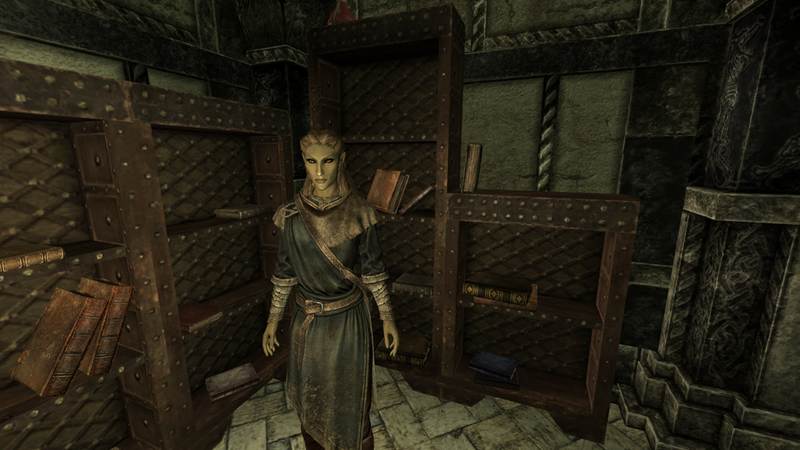 She enlisted in the Whiterun guard after lower primary school. Her family did not have the money to continue her schooling after the compulsory education period. Guard work suited her well, though, and she gained recognition quickly. 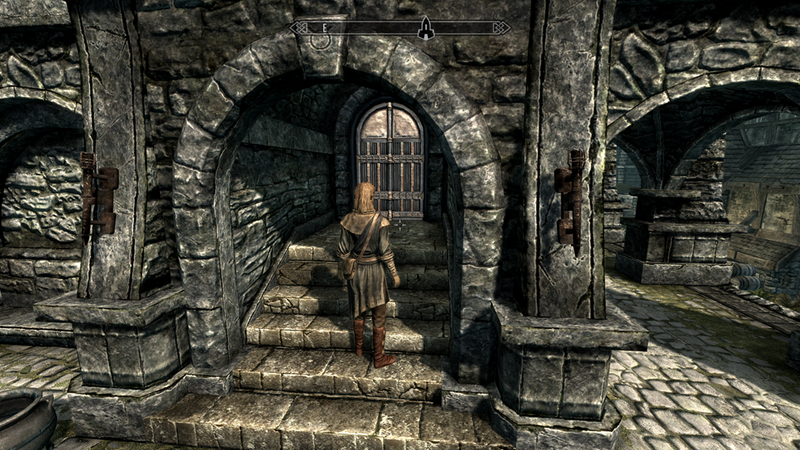 The Guard Captain put her name on a list of recommendations to Jarl Balgruuf for a rare housecarl opening. She wanted it more than anything, and bested 9 other candidates in competition for it. That was one week before I arrived in Whiterun. I was her first assignment. This explained much about her enthusiasm, and eagerness to please. As well as her occasional attitude. I had seen this many times with new guard recruits back home. When the turn came to share my story, I skirted around most of it. Truthful, but missing key facts. I said my brother and I were born in Cyrodiil, not the Summerset Isles. We were born in the Imperial City, where our parents were stationed following the signing of the White-Gold Concordat. 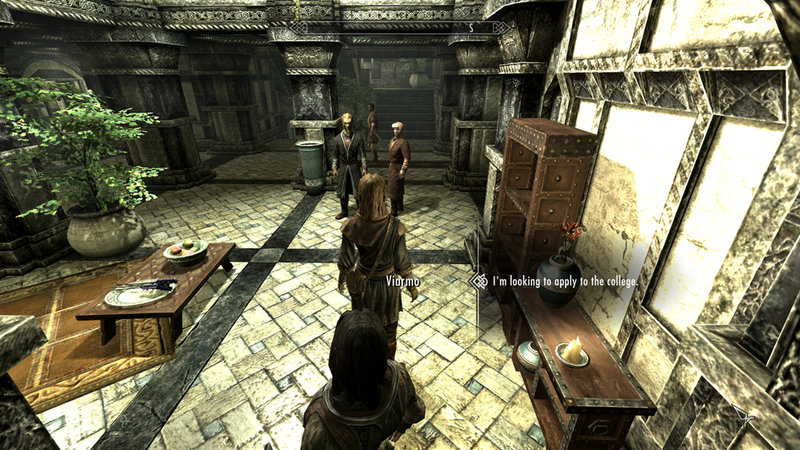 My brother and I really never knew our parents; they were away with Thalmor business for most of our youth. We were mainly raised by our equivalent of a housecarl, a Bosmer named Anariel. Perhaps that is why my brother and I were so different than our parents. Our values and cultural upbringing were more Cyrodiilian, rather than traditional Altmer. My brother and I were twins, though he still referred to me as “little” sister, and I called him “older” brother. Older than me by 37 minutes. A 3rd glass of wine and fatigue made thinking of my brother difficult. I felt a lump in my throat, threatening to make me cry. I abruptly told Lydia I was tired and going to bed. She wished me a goodnight, concern on her face, but disciplined enough not to ask. Her guard training was exemplary. Upon laying down to rest, silent tears rolled down my cheeks. I was an applicant of the Bard’s College, the first part in my life’s goal. I wished for nothing more than to tell Alinius that I made it. At some unknown hour, I drifted into sleep.